I love Mexican food, but I try no to eat it out very often. I lack self control and always over do it on chips and salsa. I've been seeing a lot of post for Baked Tacos on Pinterest and decided to give them a try. I stuffed the shells with a mixture of taco meat, refried beans, salsa and cheese. They were wonderful. If you are pressed for time, you can make the meat mixture ahead of time and assemble the tacos when you are ready for your fiesta. I took this recipe one step further and made my own taco shells. I actually baked them draped over the oven racks. They only took a few minutes to crisp up. Be careful though - they go from not done to done in a flash. I actually burned my first batch because I walked away. Luckily I had a whole package of corn tortillas to play with. In a large skillet, cook hamburger meat until no longer pink. Drain fat. Return meat to pan and stir in beans, salsa and taco seasoning. Allow to simmer 5 minutes. Spoon meat mixture into taco shells. Place in 9x9-inch pan. 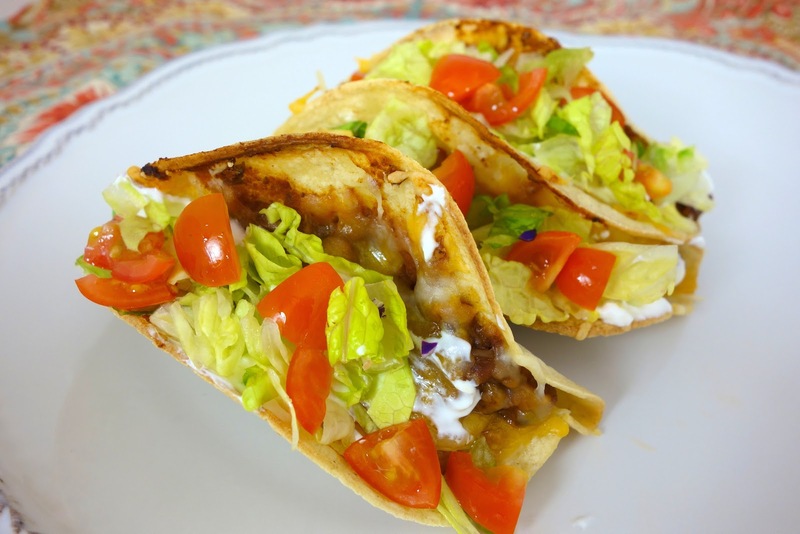 Top tacos with cheese. 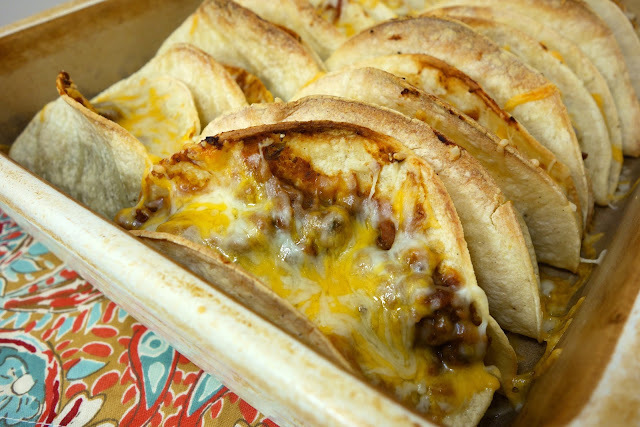 Bake for 15-20 minutes, until cheese is melted and tacos are crispy. Top with favorite taco toppings. Wrap tortillas in a damp paper towel and microwave for 30 seconds. 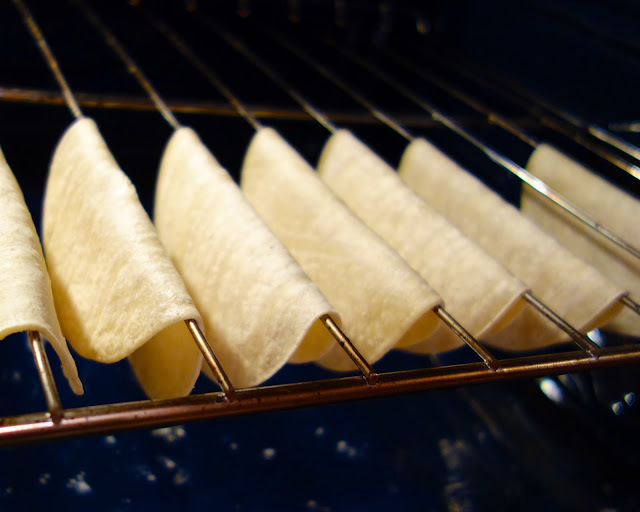 Spray both sides of the tortillas with cooking spray and drape each tortilla over one or two bars of your oven rack. Bake until crispy, about 7-10 minutes. Looks yummy! Would be a big hit with my family! I too made the Pinterest ones, and loved them. They have a better taste and stay together. I did not venture to make my own shells, however, so yay for you! I am SO trying the taco shell trick. I have made them before by frying them, but it's tricky to get them to stay apart. This looks perfect. I don't think you've ever posted any recipe that didn't look completely delicious. I do believe I'll be making this next week. Thanks! Made these this weekend and loved them! I used both monterey and cheddar cheese, bc that's what I had on hand. I really liked the different texture that was created by baking them, and yet they still remained very crunchy (especially if I didn't overload them with the meat mixture. Will definitely make these again. I really like salt on corn tortilla shells. Any thoughts on how to get the salt to stick to these? When I fry them, I salt them as they come out of the oil and it's awesome. Transoumom -spray the tortillas with some cooking spray and salt them before baking them. Enjoy! I need to try that shell technique with my homemade corn tortillas.